In these long breaks between the signature 21 Essays series, I’m running a new feature where I randomly select a year or set of years, and then brainstorm on some possibilities for 21 Essays series that could emerge from the assigned time. For the current round, the roulette wheel has spun, gradually slowed, then clicked to a stop, pointing at: 1930. So here’s my third 1930 series possibility: 21 essays on Le Roman de Renard (The Tale of the Fox) by Ladislas Starewicz. The Tale of the Fox (1930). Sooner or later, I can guarantee that I will do a series on Ladislas Starewicz, pioneering animation genius. 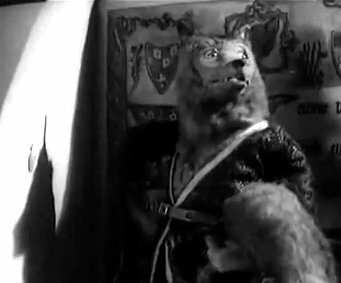 I could do the series on his acclaimed early silent masterpiece The Cameraman’s Revenge (1912), or on his unclassifiable and jaw-dropping brilliant short Fetiche (The Mascot) from 1934, or maybe today’s choice, The Tale of the Fox. At a time when live-action directors were struggling to adjust to the demands of their new clunky, stagebound sound equipment, Starewicz brazenly embarked upon the production of a full-length animated epic (seven years before Disney’s Snow White and the Seven Dwarfs). The Tale of the Fox is sixty minutes of wall-to-wall brilliance. Starewicz’ approach to folk tales is urbane, witty, and lavishly imaginative. For decades, this masterpiece was virtually impossible to see, but now all it takes is a simple click to YouTube, where you’ll find a surprisingly clean and attractive print. Sample a bit of the beginning for a taste of the Starewicz style then stick around for the fun ride (and imagine what the world would be like if this had caught on rather than the Disney approach…). Over the next two days, I’ll be proposing some more 1930 ideas (with no promises that I’ll necessarily be getting to any of them…). But I’m wide open to other suggestions. Any ideas for 1930 movies, books, short stories, poems, songs, or other cultural artifacts that might inspire a good 21 Essays series?